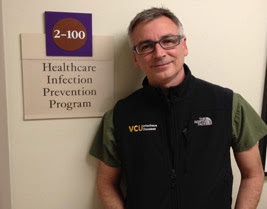 Those of you who have followed our blog for the past few years probably know that one of my favorite topics in infection prevention is the role of clothing in transmission of pathogens. But I'm also fascinated by the sociologic aspects of clothing in medicine, which is usually framed around questions of professionalism (for example, is a doctor in a white coat more "professional" than a doctor wearing scrubs?). So I was interested to see another paper on this topic in JAMA Internal Medicine. The study was a survey of family members of ICU patients in three Canadian ICUs. Over three hundred persons viewed photographs of physicians dressed in scrubs, business suits, white coats with neckties, or blue jeans. The study subjects were then asked to match the variously dressed doctors with certain attributes. In a nutshell, they found that families deemed the doctors in white coats to be most knowledgeable, most honest and best overall. Doctors in scrubs and white coats were deemed equally most competent and most caring. I'm always amused by these studies because I've never met a patient who chose their doctor on a sartorial basis. It would be like buying a red car because you love that color even though you know nothing else about the car and never took it for a test drive. These types of studies, in my opinion, sell patients short. Yes, all of us form rapid first opinions about those we encounter, but almost all of us are sophisticated enough to quickly move past superficial qualities to assess a person's honesty, ability to communicate, and for physicians, his/her ability to demonstrate empathy. Lastly, the entire premise of the study seems strange--while you might choose your primary care doctor, it's extremely unlikely that you will choose your intensivist. The accompanying editorial is congruent with my line of thinking and concludes that professional behavior is far more important to patients and families than professional appearance. I stopped wearing a white coat a decade ago, but many physicians still cling to it. Some wear them for storage, which my wife (also a doctor) tells me is more important for women since their clothing has fewer pockets. Some wear white coats as a form of identification, which may have held true when doctors were the only people in the hospital wearing them. Some wear them for warmth. And some just need the ego boost. I was an early adopter of bare below the elbows and have only worn scrubs when seeing inpatients for the last five years. Smart phones and cargo scrub pants have taken care of my storage needs. But the one downside of scrubs is feeling cold in the winter. My partners and I recently solved that problem. We found vests that are lined but are constructed of nylon on the exterior surface, which allows them to be easily wiped down. They fit snugly so they don't drape onto the patient when performing an exam. And yes, they are warm! I'd like to take credit for the idea, but actually we copied our intensivists, most of whom are also bare below the elbows. On April 1, we embark on a new policy at my hospital that no longer requires contact precautions for patients with MRSA and VRE. As we educate our staff on the change, we're reminding them that it's ok to shed the white coat and tie. If we're not going to wrap ourselves in plastic, bare below the elbows seems even more important.